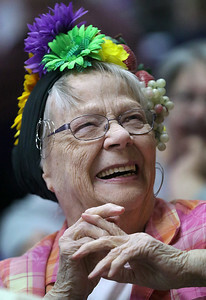 Matthew Apgar - mapgar@shawmedia.com Alberta Austin of McHenry laughs with friends while dressed festively for a Mardi Gras luncheon and party for seniors on Friday, Feb. 5, 2016 at the McHenry Township Hall in Johnsburg. The event was sponsored by Fox Point, Crystal Pines, and First Light Home Care and featured music by the Sinful Saints. 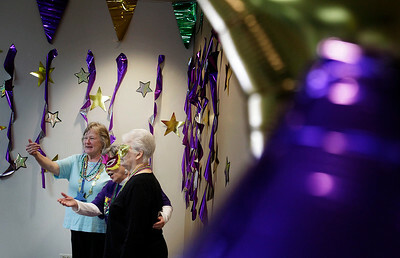 Matthew Apgar - mapgar@shawmedia.com From left: Jan Shannon, Barb Nyhus, both of McHenry, and Alice Osinga of Richmond pose for a photograph in a decorated corner of the McHenry Township Hall during a Mardi Gras luncheon and party for seniors on Friday, Feb. 5, 2016 in Johnsburg. The event was sponsored by Fox Point, Crystal Pines, and First Light Home Care and featured music by the Sinful Saints. 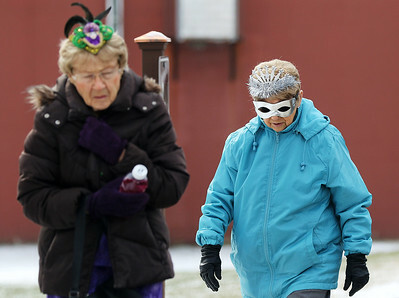 Matthew Apgar - mapgar@shawmedia.com Betty Buchel, front, and Helen Leider of McHenry walk up to the McHenry Township Hall for a Mardi Gras luncheon and party for seniors on Friday, Feb. 5, 2016 in Johnsburg. The event was sponsored by Fox Point, Crystal Pines, and First Light Home Care and featured music by the Sinful Saints. 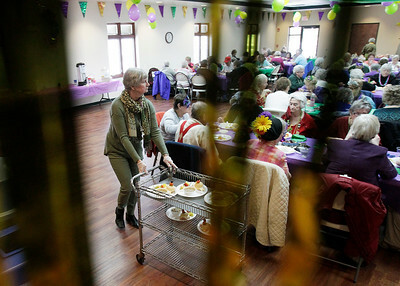 Matthew Apgar - mapgar@shawmedia.com Rita Boulden of Johnsburg pushes a cart of food through the McHenry Township Hall during a Mardi Gras luncheon and party for seniors on Friday, Feb. 5, 2016 in Johnsburg. The event was sponsored by Fox Point, Crystal Pines, and First Light Home Care and featured music by the Sinful Saints. 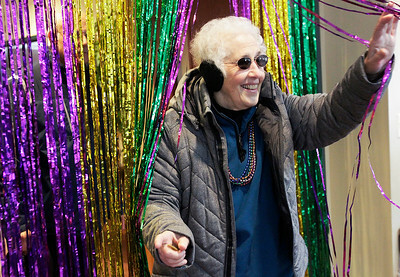 Matthew Apgar - mapgar@shawmedia.com Rickie Hermann of McHenry waves to friends as she passes through a decorated doorway during a Mardi Gras luncheon and party for seniors on Friday, Feb. 5, 2016 at the McHenry Township Hall in Johnsburg. The event was sponsored by Fox Point, Crystal Pines, and First Light Home Care and featured music by the Sinful Saints. 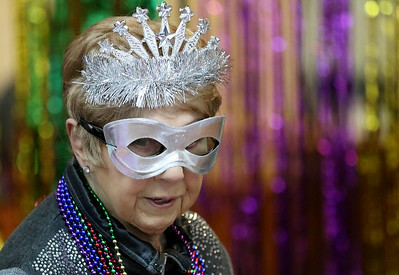 Matthew Apgar - mapgar@shawmedia.com Juanita Roth of Johnsburg dons a red, feathered mask during a Mardi Gras luncheon and party for seniors on Friday, Feb. 5, 2016 at the McHenry Township Hall in Johnsburg. The event was sponsored by Fox Point, Crystal Pines, and First Light Home Care and featured music by the Sinful Saints. 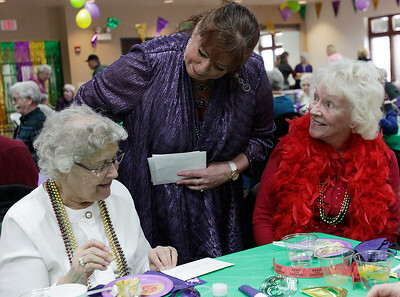 Matthew Apgar - mapgar@shawmedia.com Helen Leider of McHenry talks with friends while wearing a festive costume for a Mardi Gras luncheon and party for seniors on Friday, Feb. 5, 2016 at the McHenry Township Hall in Johnsburg. The event was sponsored by Fox Point, Crystal Pines, and First Light Home Care and featured music by the Sinful Saints. 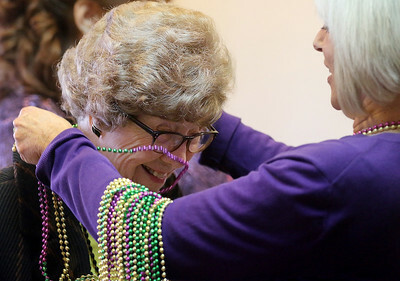 Matthew Apgar - mapgar@shawmedia.com Anna Figura of McHenry, left, gets a necklace of beads from Paula Winston of Crystal Lake during a Mardi Gras luncheon and party for seniors on Friday, Feb. 5, 2016 at the McHenry Township Hall in Johnsburg. The event was sponsored by Fox Point, Crystal Pines, and First Light Home Care and featured music by the Sinful Saints. 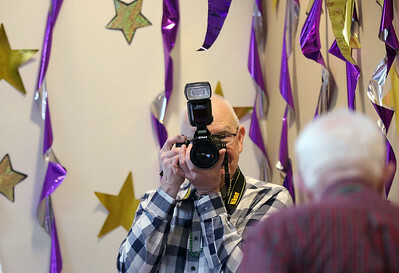 Matthew Apgar - mapgar@shawmedia.com Photographer Bob Griffin of Greenwood Township takes photographs of seniors enjoying a Mardi Gras luncheon and party on Friday, Feb. 5, 2016 at the McHenry Township Hall in Johnsburg. The event was sponsored by Fox Point, Crystal Pines, and First Light Home Care and featured music by the Sinful Saints. Matthew Apgar - mapgar@shawmedia.com Judy Nordschow, representing Fox Point, center, awards Shirley Brucki, left, both of McHenry, with a free lunch prize after discovering a plastic baby figurine baked into her piece of cake as Marcia Becker of Richmond, right, watches during a Mardi Gras luncheon and party for seniors on Friday, Feb. 5, 2016 at the McHenry Township Hall in Johnsburg. The event was sponsored by Fox Point, Crystal Pines, and First Light Home Care and featured music by the Sinful Saints. 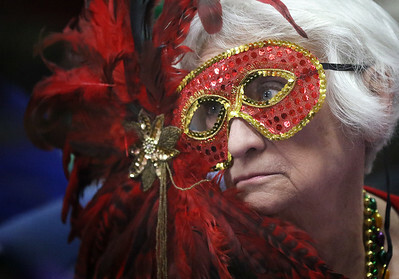 Juanita Roth of Johnsburg dons a red, feathered mask during a Mardi Gras luncheon and party for seniors on Friday, Feb. 5, 2016 at the McHenry Township Hall in Johnsburg. The event was sponsored by Fox Point, Crystal Pines, and First Light Home Care and featured music by the Sinful Saints.